Owned until the end of his retirement and later sold to producer Daniel Ray. A chrome Seymour Duncan Firebird mini humbucker pickup replaced the original pickup in the neck position. Tuners were also replaced with Grovers. 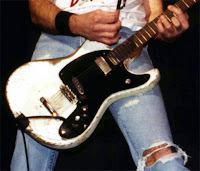 The Mosrite vibrato and bridge assembly was also taken off and replaced with a Gibson style stop tailpiece and bridge.